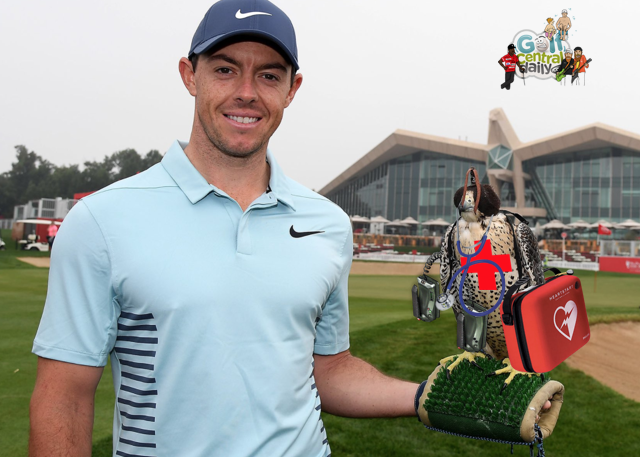 Following news of a minor heart issue, Rory McIlroy unveiled his new cardiac falcon in Abu Dhabi yesterday. The highly trained cardiac falcon named "Clear" was commissioned by Nike and will fly overhead Rory at all times during the 2018 season via a piece of raw turkey meat taped behind his ear. "Clear" comes equipped with a defibrillator and paddles and is fully trained in their use. Rory McIlroy with his new cardiac falcon "Clear" yesterday.